plus bonus copies (no additional charge) of my book. On November 4, I finished my run across America. It’s been 5 years since that exciting day. On September 19, I stepped off the starting line in San Francisco. It took me 52 days to make my way on foot from California to New York. On your mark, get set, go to the “Buy Now” button at right to order your copies, and we’ll notify you right away if you’re one of the winners. But when you’re buying the book, signed and at a discount, how could you lose? 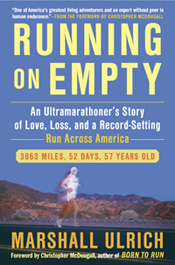 This entry was posted in Book, Running on Empty (2011), Run Across U.S., SFO-NYC (2008). Bookmark the permalink.